Popping Blue Bottles is now finished with exception to only one large and one small available at this point. Popping Blue Bottles 89cm x 96cm, also in 108.5×116.6 both sizes are available framed or unframed, see note above. 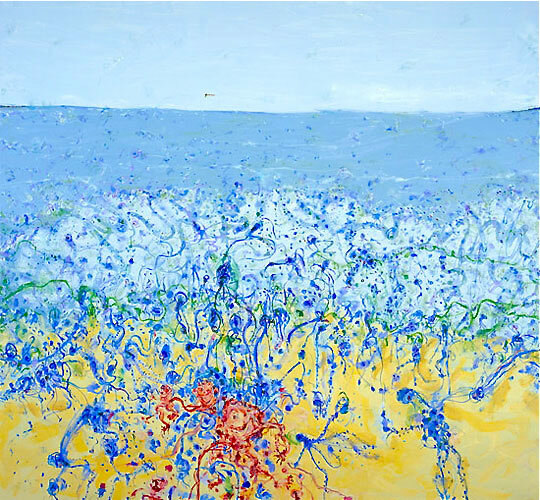 This is a new fine art print work by John Olsen titled “Popping Blue Bottles 2007”, it is a limited edition quality fine art print signed and titled by John Olsen, the edition has been limited to 250 only, Etching House framing is at wholesale. The fine art print “Popping Blue Bottles 2007” is made on high quality Archer’s archival paper a with pigment ink then combined with using the best quality technology affordable. John Olsen is also famous for his Frog series is a signature image for John Olsen and has always been very popular. John Olsen and some other artist have felt Australian fine art limited edition reproduction prints are a way for art lovers to be able acquire an affordable piece of his wonderful fine art works as there is only one original painting, works on paper or water color. John Olsen’s traditional fine art etchings prints silkscreen’s Lithographs have so far made it possible to let the public enjoy his creative work, how ever now with the Australian fine art edition quality re-production prints have made it possible for all to afford and enjoy his fine paintings and works on paper even more so. The limited edition fine art reproduction works of art is a way to also build the archive of a life time of works belonging to the master and talented Australian artist John Olsen for everyone in Australia and overseas to enjoy or collect from Etching House. All fine art prints are signed and titled by John Olsen. John Olsen – all mediums of fine art are available at Etching House. Etching House specializes in John Olsen fine art prints and etchings. Museum grade archival collectable etchings and prints by John Olsen are in stock at Etching House. Lay Buy’s for John Olsen art is available at Etching House, talk to Etching House about framing your special and collectable John Olsen artwork. John Olsen fine art is always coming and going at Etching House, join the Etching House mailing list to keep up to date with John Olsen new releases.